Durga Puja is celebrated in West Bengal since the Medieval Period, also known as the period of Mughal Empires. In 16th Century the Durga Puja was held in the Court of Rajshahi, and in Nadia District in 18th Century. However, in 18th Century it became popular. The Zamindar families of the city are quietly carrying on with their traditions, some of which started hundreds of years ago. By mid of 18th Century, the national festival of the Bengalis became an occasion for the rich Babus of Kolkata to flaunt their wealth. It became a religious splurge among the Babu's of Bengal, to measure the supremacy of one over the other. The first Durga Puja seems to have been celebrated by Bhabananda, the ancestor of Maharaja Krishnachandra of Nadia, in or about 1606. The family puja of the Sabarno Roychoudhuris of Barisha dates back to 1610 – the oldest in Calcutta, and conducted even today in a highly traditional style. The traditional household Durga Pujas gained prominence because of their deep and passionate devotion to Goddess Durga. The puja at Shovabazar Rajbari, is among the oldest Pujas in the city, organised by Raja Nabakrishna Deb of the Sobhabazar of Calcutta in honor of Lord Clive in the year 1757. The puja was organized because Clive wished to pay thanks for his victory in the Battle of Plassey. He was unable to do so in a Church because the only church in Calcutta at that time was destroyed by Siraj-ud-Daulah. Some of the other significant Pujas are the 250 yrs. old Durga Puja in Dhar family residence in Bikrampur of undivided Bengal still continues in Ashoknagar. The Bikrampur's Hasara village in Bangladesh in 1775 A.D. and still continues till date in their Bagbazar residence. An incident changed the heartless rituals of sacrifice in the Dhar family. Kashinath Dhar was the zamindar of Bikrampur then. He performed Durga Puja at his residence with full traditional rituals. Ashtami was the sacrifice day. It was during the time when human sacrifice was common and was considered the most important part of the Puja. It was on this day the 'Kharna' (weapon used to sacrifice) landed on the child's head, left the child unharmed. With repeated attempts the result remained the same. There was a commotion and when the news reached the zamindar, he fell unconscious. On regaining his consciousness he tearfully prayed the Goddess asking her the reason for the omen. Durga then appeared before him and asked him to stop sacrifices and told him she had placed her hand over the child's neck to protect it and has wiped her hand in a cloth, which is behind the idol. On hearing this, the zamindar rushed to the mandap and found the blood stained cloth. Henceforth, sacrifice was stopped in the Dhar family Puja. Durga Puja took a complete social turn when it started being organized by the common people. The Ghosh family came to Pathuriaghata at the time of Warren Hastings. It is said that Warren Hastings and his wife visited the Ghosh family. Khelat Chandra Ghosh (1829-1878), grandson of Hasting’s banyan (clerk) Ramlochan Ghosh, shifted out of the old family house at 46 Pathuriaghata Street to a new house at 47 Pathuriaghata Street. The family made remarkable contribution in music and charity. 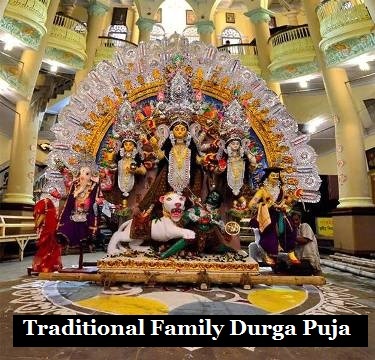 The Family Durga Puja is celebrated still in a traditional way. Gobinda Ram Mitra's of Kumartuli started their Puja in 1800. Samir Dasgupta's household Durga Puja commenced in 1839, in Batajor village in Barishal in Bangaldesh. The tradition still continues till date in Srimani Para Lane residence in Baranagar. Sacchidananda Chatterjee continues with his 200 yr. old household Durga Puja at his residence in Brahma Samaj Road. Other Famliy Pujas like Krishnadeb of Sobhabazar, Mitra Family of Chorbagan, the Seal family of Chorbagan from 1856, Srimani family of Sukia street, traditional Durga Puja at Rani Rashmoni's residence and Kaliprasanna Singha's Family Puja. All these Family Puja are still carried on in Traditional way. Some of the fragmented Families who are not united today, passed on the responsibility of Puja to their Munims to carry on with their family’s tradition.